The work of Ellen H. Clapsaddle (1865 – 1934) is somewhat recognizable. There’s just a certain look to her postcards and the children that often appear on them. 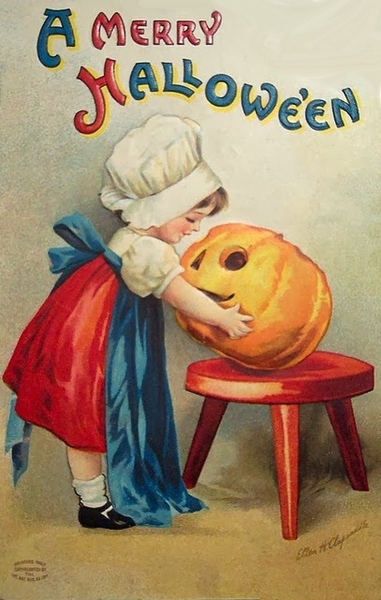 This Merry Halloween postcard features one of those children. A little girl in a red and white dress with a blue apron checks out a jack-o-lantern. The carved pumpkin is sitting on a bright red, three-legged stool that is the perfect height for the child to reach the pumpkin. Like most of Clapsaddle’s work it is signed.